This port with integrated oxygen sensor is for customized application in flexible, bag-type bioreactors like storage and mixing bags. It is mainly designed for cell culture applications but can also be used for monitoring microbial fermentation. The port is made of polyethylene which allows easy welding with the bags. A polymer optical fiber is attached to the port from the outside to read out the sensor. 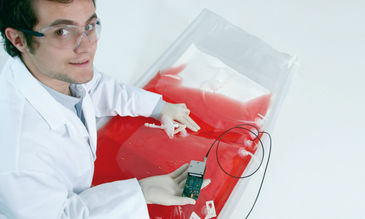 The Nice Port DO enables contactless measurements in culture bags, so there is no risk of contamination. Response time (t90) < 6 sec.